Wearing the right footwear is important for infants and toddlers to form a normal walking pattern, which is why Attipas is the number one choice for your little one. Attipas baby and toddler shoes are perfect for children from 6 months up to 4 years old. This is exactly the age when the feet grow and your baby must develop the correct gait. Our shoes are made in South Korea and have been designed after seven years’ research & development in conjunction with the Motor Development Center at Seoul State University. Their design is based on kinetic and physio-dynamic tests of toddlers' walking. Attipas enables a steady and stable walking pattern, in terms of the angle of the leg joints. Attipas shoes also facilitate cognitive development by enabling the toddler to feel the ground beneath their feet and respond to that stimulus. 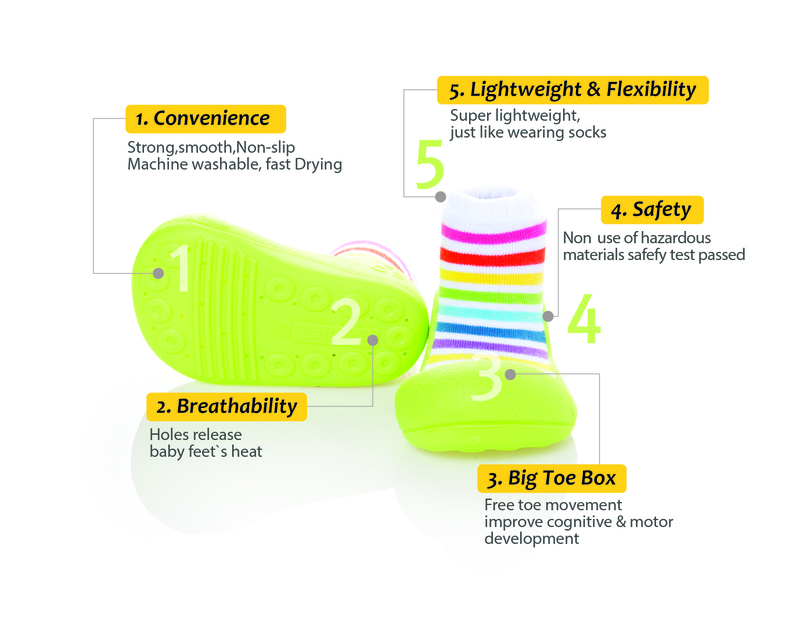 Attipas corrects toddlers’ walking behaviour by equally distributing the pressure across the soles of the feet. It is well known that the best choice for fast and correct development of babies’ feet is walking barefoot. But due to natural and social circumstances, our babies cannot keep their feet bare all the time. This is why the Attipas line of shoes for infants and toddlers was created. Attipas shoes are a new type of sock-shoe created in accordance with foot shape and the walking characteristics of infants and toddlers. Attipas are the world's first combined indoor and outdoor functional shoes for toddlers and babies under 4 years old. Your baby can use Attipas as slippers when wearing them at home, especially if you have a cold or slippery floor. Attipas are very easy to put on and take off, which makes them very comfortable for nursery or kindergarten. There is no need to tie laces or zip up them. Your baby can wear them as regular socks. Attipas is the best footwear for indoor public playgrounds, gaming facilities, labyrinths, children's rooms, Lego Lands and many more. You can leave them on even if there is a sign saying “no shoes”, as Attipas are not classic baby shoes, but rather sock-shoes. This makes Attipas shoes convenient from a hygiene point of view, because the baby’s feet do not touch dirty surfaces, especially in public places where there are many other children going barefoot. They are an excellent choice for shopping centres, especially in the winter. When wearing heavy winter shoes, little feet may overheat, but Attipas shoes will keep your child comfortable and you will be both able to enjoy shopping. They are great as spare shoes for children's parties when visiting relatives and friends’ houses. They take up very little space in a mother's bag and they can be put on really quickly. Attipas make ideal kids’ shoes for taking walks out on the street when the weather is warm and dry. In Attipas shoes your child feels comfortable when climbing, jumping and running, as their sole does not slip and is very flexible. Depending on the outside temperature Attipas can be worn either on bare feet or with an additional pair of socks. Attipas footwear is great for walking in nature, whether on grass, small stones, ground, sand etc. Little feet will feel as close as possible to barefoot, while at the same time being protected from injuries and cuts. Attipas baby shoes are suitable for walks on the beach or near water, at pools and so on. It is absolutely fine if they get wet, as you can dry them as fast as you would regular socks. Attipas is the best option for outdoor kids’ playgrounds, because they are lightweight and flexible, so the child’s feet can move freely and not grow tired. Wearing Attipas outdoors don’t be afraid that the shoes will get dirty, because they are machine washable. You can read more about our shoe cleaning instructions here. Safe: all the shoes are made of non-toxic and safety-tested materials. No use of hazardous materials, adhesives or formaldehyde. Convenient: durable, non-slip sole, machine washable, fast drying. Suitable for both indoor and outdoor activity. It is well known that babies touch, bite and taste everything they can get their hands on, especially if these things are bright and visually appealing. This is why Attipas shoes are manufactured from completely safe materials. The outsole is made of 100% non-toxic TPR and the sock (upper) is made from 80% cotton. Attipas has successfully passed Toxicity and Formaldehyde tests. Thanks to their unique production technology, Attipas does not use any hazardous materials, adhesives or formaldehydes in the manufacturing process. Attipas guarantees your baby’s safety! Attipas is made in South Korea and is sold in over 40 countries around the world. The model range numbers more than 50 different styles. The modern and unique design of Attipas baby shoes cannot be confused with anything else and will make your child the centre of attention! Most importantly, your little one wearing Attipas shoes will bring you as much joy as it does them, secure in the knowledge you are making the best choice for your baby's feet! Finally, Attipas baby shoes are available in the UK! Now you can buy these unique, revolutionary, smart and healthy shoes at our e-shop!